What to do When Baby Wakes from Nap After Only 20 Minutes. If your baby wakes from a nap after only 20-30 minutes, you can be sure that it isn’t because he had a full nap. Baby woke early for some reason other than being fully rested. If baby is waking after only 20-30 minutes of sleep, it it is time to do some troubleshooting. There is an exception to this. It is if you are at the point of almost being ready to drop a nap but aren’t quite there. For example, when Kaitlyn was in the process of dropping her 3rd nap, she would take only a 20-30 nap some days in place of that third nap. But other than that situation, you know that if your child wakes after only 20-30 minutes, the nap was not long enough. You probably already knew that a 20-30 minute nap was not ideal. What you want to know is what to do about it. There are a lot of options, and your course of action will depend on your, your child, and the age of your child. Something I didn’t know with my first two children is sometimes babies will lay in bed quietly for 20 minutes and then start crying. I saw this on my video monitor with my last two children. If this is the case, your baby most likely needs waketime adjusted. If the length you are doing was working great in the past, you likely need it a bit longer. Try adding five minutes and then work up from there. 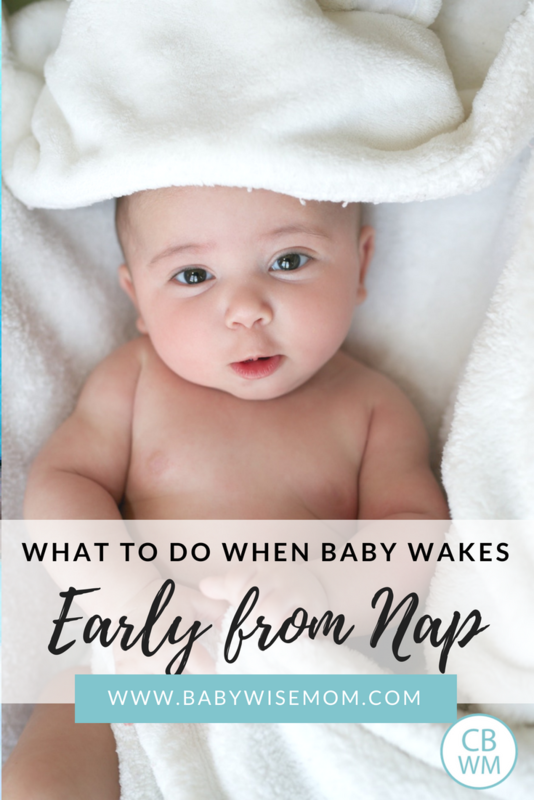 Typically a waketime that was too long will result in crying at the beginning of the nap–as soon as you put baby down. Once you are working on that, you need to decide what to do in the meantime. If you can quickly see the reason for the early waking (too hot, poopy diaper, etc. ), your first step would be to alleviate the reason. Change the diaper. Change the clothes. Fix the problem. When Kaitlyn would wake early from naps as a newborn, it was usually after an hour long nap. At this point, it was better for her to move to the swing to finish out the nap. There were two times she woke after 20 minutes of sleeping. Those two times, I had her CIO (Cry it Out). If your child has a good enough nap, often CIO in the middle doesn’t work. If the nap was really short, then it often does work. If CIO doesn’t work at first, try again at an older age if your child still has napping problems. Several moms have found that once the baby got older, it suddenly worked. Good luck in your troubleshooting! Previous Post Poll Results: What Method Did You Use to Drop the Swaddle? Hi. I have a 7 week old who is having problems. I try to stay on a schedule, feeding every three hours and having activity/awake time after and then down for a nap. She takes a VERY long time to feed (we have had lots of feeding issues) and I breast feed and then have to supplement a couple ounces of formula. Once she is done eating (it sometimes takes an hour!) then she usually only can handle 10-15 min of awake/activity time. She gets fussy or starts yawning a lot. The last couple of days she is not napping well at all (she usually naps great during the day, night is a different story). She goes down fine but then wakes up about 30 min into the nap screaming. I try to wait a while then go in and comfort, etc but she wont settle. Also, shes been working up to an 8 hour sleep at night (shes done it twice) but lately she screams and screams for hours (off and on and in between feeds) and starts the long sleep process wayyyyyy late (last night it was 4am-noon). I dont know what to do? Thats the first time shes slept that late, I didnt know if I should wake her since shed been awake most of the night screaming? Earlier tonight I re read about the 45 min intruder and tried feeding her when she woke up early from her evening nap and she did take a full feed. Is she just hungry and having a growth spurt? Do I feed her every single nap time that she wakes up early for a few days? When feeding takes so long in the first place, it makes me feel like I have just fed her when she wakes up with that “45 min intruder” (if that is even what it is?). I read about cutting back on awake/activity time, but she doesnt even hardly have any to begin with. Any advice? I also forgot to add that shes been taking another ounce more than usual the last day as well, so I think its a growth spurt? Hi, I have a question. My son is 13 weeks old. He was on a 3-hour feeding schedule, taking naps well (1.5-2 hrs)and our only issues were at feeding time due to his reflux/GERD. (he’s currently taking Prilosec) But, for the last almost 3 wks now, he will only sleep 1 hr at a time and is eating every 2 hrs…2 and a half if we are really lucky. When he wakes at the 1 hr mark, I have tried letting him CIO, but he never goes back to sleep. So, I just get him up and feed him and he seems to take a full feeding. I know it can’t be a growth spurt because it wouldn’t have lasted this long. I have tried shortening his waketime and lengthening it – it doesn’t seem to make a difference how I do it…he will only ever sleep for 1-hour naps. Any ideas?? She’s 4 1/2 months old now. Please help!! I’m the mom of a 6 week old. He is having problems taking his naps. He’ll take maybe 2 good naps a day (the 2 morning naps). The other ones, he will cry at least an hour… and sometimes more. I let him cry it out, but when it gets to an hour, I figure that’s too much! 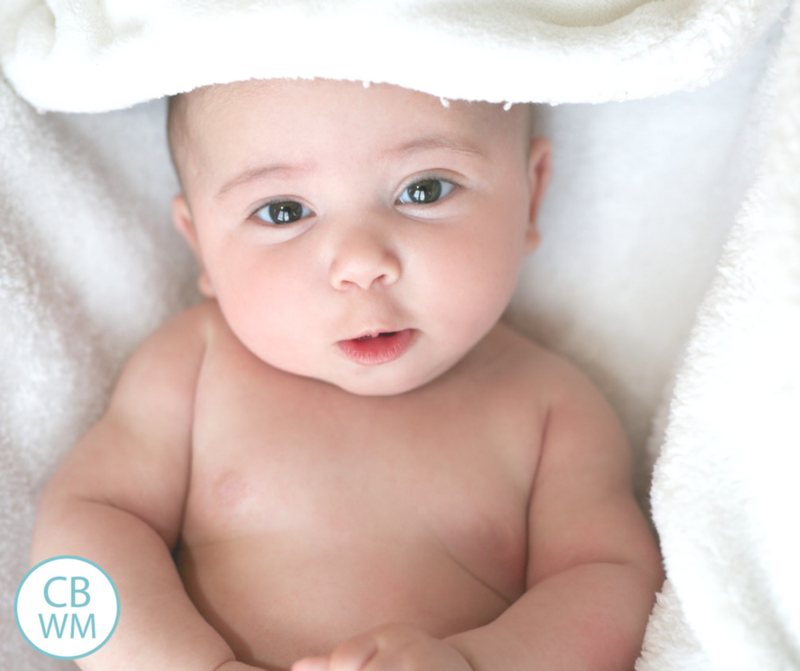 I’ve tried changing diapers, swaddling (which he will usually kick out of), and pacifiers. His cries start out fussy, then build to crying very hard. I would think that the cause was that he was hungry if it wasn’t such a pattern. Any advice?? Thanks SO much! Hi! I’ve got 2 questions for you:1) My 7 week old does great taking his 2 morning naps (2 hours following feeding and wake time), but will not take his afternoon naps very well, and sometimes not at all. He will scream to go down and will cry for an hour before I go to pick him up. That goes for afternoon as well as evenings until bed, (which he does great going down to bed.) What should I do to help him go down for the afternoon naps? 2) I started last night to try to wean him off the night feeding. He woke up at 4:45am and cried until 5:30, then woke up for good at 6:00am. My question is that my day doesn’t start until 7:00. You’ve said before that if they wake up early like around 5:30am, go ahead and feed them, put them back to bed, then feed them again at 7:00. Since I fed him at 6:00, how should I work the schedule for the rest of the day? ?Should I let him sleep extra long on his first morning nap so we can stretch it until his regular feeding time of 10:00? ALSO I normally feed him 7 times a day, and with cutting out the 3am feeding that takes him down to 6 feedings. Is that ok at 7 weeks?? I found your website about 3 weeks ago. What a huge blessing! Don’t give the Babywise book to a neurotic perfectionist without support :). Anyway, I’m having an issue with my 14 week old daughter, Kara. She has been sleeping great for naps up until about a month ago (she had been such a sleepy head. It first started with waking early and I tried your easy nap fix and it worked for a few days, then about a week ago she started with waking up 45 minutes on the button for every nap. The first 2 naps of the day I just get her up and hold her off until it’s been 2.5 hours then feed her. However – by the 3rd nap she’s exhausted and still wakes at 45 minutes. If I rock her, she’ll go back to sleep for another 45 min to an hour. I think she’s having an issue with self soothing. Any suggestions to help her figure it out? We also think she may be teething – do you think this is waking her? Thanks for your help! and one more thing – we tried CIO after the 45 minutes. She never goes back – she’ll cry for 45-60 min and then she’s so upset and exhausted – and the next nap she still only sleeps 45 min. There’s nothing worse than an overtired baby! Katie, I just now saw your question. Let me know if you still need help. Sorry about that! I have a question about my 7 month old daughter. Her naps just recently started being 1.5 hours, which is great compared to what they have been. I’m still hoping eventually they’ll be 2 hours, but for now I guess I need to be thankful. She’s on a 4 hour eating schedule. If she wakes after only an hour nap, or sometimes even if it is the full 1.5 hours, a lot of times there’s about an hour before she’s due to eat again. And with only being able to be awake 2-2.5 hours before being ready to go back down, then that leaves only an hour after she eats before her next nap and then it gets to where it’s almost time for a nap right after she eats. For example, this morning, she ate at 9:00 and went down for a nap at 10:30 (didn’t fall asleep until 11:00). She woke up at 12:00, but is not due to eat again until 1:00. What do I do in this situation? Should I feed her at 3.5 hours instead of 4 when this happens to allow for more waketime after she eats? Or will that throw of her schedule and make her want to eat earlier than her normal 4 hours? See these:Waketime When Baby Wakes Early : http://babywisemom.blogspot.com/2008/04/waketime-when-baby-wakes-early.htmlWaketime When They Wake Early: http://babywisemom.blogspot.com/2007/11/waketime-when-they-wake-early.htmlEat/Wake/Sleep Cycle: http://babywisemom.blogspot.com/2008/03/eatwakesleep-cycle.htmlOne thing is if she consistently gets up early at the same time each day, perhaps you need to do a shorter schedule then (like 3.5 hours).Also, if she consistently is talking for 30 minutes before falling asleep, she might need a longer waketime. Even just 5 minutes can sometimes make the difference. Hey there! I have a 10 week old who is doing AMAZING on her schedule. Eating every 3 hours, taking great naps…except her 4th nap. This is the nap that she usually will fuss for about 10 minutes before she falls asleep. She will only sleep between 15-30 minutes then she wakes up screaming – unable to let her CIO. Do you think she is just not needing this 4th nap? Or should I let her sleep longer on her 3rd nap? Although when I get her up she’s still pretty fussy. Thanks for the help! Oh, and I tried feeding her when she woke (45 minute intruder) but she didn’t take a full feeding so I don’t think it’s hunger.Thanks for your help/suggestions! Hi! Thank you so much for this blog, its helped me so much with my daughter, who is now 6 months. She’s on a 3.5-4 hour schedule starting at 7. Our problem is that for the past 2 weeks she has been waking early from her afternoon nap–she still naps about 1.5-2hours in the morning, but for her 1pm nap, she wakes screaming after only 45-60 minutes. Her waketime is about 2 hours, and I’ve tried shortening and lengthening it. Now her evening nap is being affected–its gone from about 45 minutes, to over 1.5 hours if I just let her sleep. Any ideas on what to do, or why just this nap is being affected? Right now I am letting her cry for about 10-25 minutes, occasionally she will fall back to sleep. There’s no different noises, or light differences at this time of day. Thanks for your help! Jill, I don’t know! Have you started solids? The best thing to do in these situations is to look back to before the problem started and when it start and note all differences. It could also be a growth spurt issue…though you would think it would affect more than that one nap.Also note if it is getting hotter in her room at that time of day. See the naps: troubleshooting post for more ideas as to why they wake early. My 3 month old wakes up happy and alert after onl 20-30 minute nap. I usually leave him in his crib to get sleepy again and start crying. Sometimes he goes back to sleep sometimes he doesnt but he can stay awake and happy in his crib forever. Do i need to go in sooner ( once he wakes up) or wait till he cries. He is not getting enough sleep and i know it i just don;t know what to do about it? please help- i need some help desperately. I need help! My son is 9 weeks old and is a terrible napper. He just won't fall asleep. Sometimes he will seem to be asleep only to wake a few minutes later. He has reflux so we were using an infant seat for a while and that helped him fall asleep. Maybe because he was on an incline. But our doctor said he needs to move back to his crib because his head will end up flat if he stays in the infant seat. So we have moved back to the crib and our problems are back. he just won't sleep. He fights it. I have tried everything. I tried cutting back his wake time, that didn't work. I tried the baby whisperer method and he will talk in his crib for 20 minutes and then work up a cry. I tried letting him cry it out but when I finally go in there he is soaked from tears. Please help! We are on a 3 hour cycle but he misses at least two naps a day. He gets over tired and then he can't go to sleep. Will this ever get better? I will try anything. Please help! MamaStew, you can use other methods of inclining. Infant seats can cause head problems. But you can buy incliners for the mattress for reflux. They have kinds that go under the mattress or kinds your baby lays right on. Part of his problem is likely just that he is used to sleeping in the seat and needs to get used to the bed. But part of it is also likely that it hurts him to lay flat. I suggest you see the label "reflux" for exact recommendations on inclining. Good luck! Hello and thank you so much for this amazing website! I am a first time mom, and my son is now 8 weeks old. I have been doing BW to the best I could since about 3-4 weeks. My son does great at night time but has always had trouble with naps. For a while it was the 45-minute intruder, then for about a week I thought he finally got naps down ( minus one or two per day). Now he is waking up every thirty min. into his nap. He doesn't cry constantly. He cries for a few seconds, is quiet for a few minutes and the cycle repeats for about thirty minutes; then thirty minutes of quiet; inand out crying, then time to feed. I've tried shortening his waketimes(50 minutes, sometimes even 40) and keeping them the same (one hour-hr. 15 min) but he constantly wakes with the in and out crying every thirty minutes. I've checked all your posts and others' comments on naps, but I haven't seen anything like this yet. Please help if you can… His first morning nap is great, the rest throughout the day has these brief in and out spurts of crying for thirty minute periods. Any suggestions from anyone will be helpful. THank you so much! mix280,The trick here is to find out why he is waking. Since he is putting himself back to sleep, be probably is not hungry–but do be sure of that before moving on to somehing else.Could he have gas or some other pain? Is it just part of the learning process? Study the "Naps: Troubleshooting Revised and Updated" post for ideas on why he is waking. Once you know why, you can come up with a plan. Hi! My 3 month old wakes after 30 min. consistently from naps! He varies from a 2.5-3 hr feeding schedule (he can go as long as 3.5)– but with these shorts naps following EASY is almost impossible! I've tried leaving him in his bed, he just lays there forever & talks/moans, but never falls back asleep… then it's time to eat, but he's been in his crib so long it's time for a nap again! (which I don't like doing that, cause then he would never leave his crib other than to eat….) I've tried helping him go back to sleep, which when he does fall back asleep he usually wakes up 15 min later (sometimes he really falls asleep & will take a full nap, but that is rare). I've tried to catch him when he begins to wake to try & stop him from waking… that only works sometimes too. He is happy when I get him after 30 min. but I can tell his eyes are still tired & he is more quiet, not as giggly as he is when he sleeps longer. I feel like I've tried everything on your blog! I've tried shorter waketimes & longer waketimes– neither solves the 30 min. nap. PLEASE HELP!!! Ebsen,Have you tried feeding him? I would suggest you spend a week feeding him immediately when he wakes early and see what happens. There is an excellent chance this is a growth spurt. Wow I would never let my baby "cry it out", even dogs go to their puppy when that cry…………….what is wrong with people these days, babies should be loved and cared for, not left alone to scream, it might be hard and you might be sleepy but it's called being a parent. Help!! My 6 week old has been waking up 20-30 min after putting him down. Every nap. He can get himself back to sleep but continues to wake and cry throughout the whole nap. The wakings get more frequent for every nap. He is on an every 3 hour schedule and has done that since the hospital. I let him cry out the nap and he usually only cries 3 or 4 minutes at a time until he gets himself back to sleep. Then wakes up again soon after. The only thing I cAn think is that it is a wake time problem. If I put him down too early, he'll stay awake in his crib happily for 20 minutes, but then I've tried extending wartime and he goes to sleep but still wakes up soon after. No matter what I do the outcome of the nap seems to be the same. Unless I pit him in the swing. Should I CIO it for a week? Or continue with the swing every nap? Or do you have other ideas? Becoming very frustrated with nap time! Thanks!! !